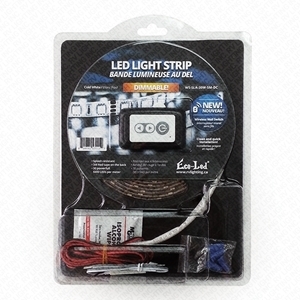 Single Colors | RV Lighting Inc.
16 feet (5 meters) roll of 10 millimeters wide cold white LED light strip. Comes with Red 3M tape on the back, DC adaptor & cleaner pack. 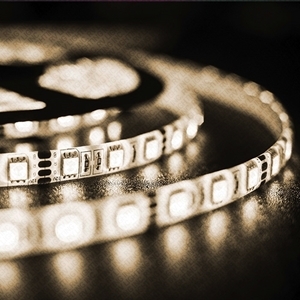 The strip is composed of 60 SMD 5050 LEDs/meter mounted on white flexible PCB. With IP65 splash protection. For details and specifications, see below. 16 feet (5 meters) roll of 10 millimeters wide red LED light strip. Comes with Red 3M tape on the back, DC adaptor & cleaner pack. 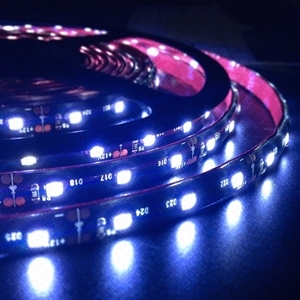 The strip is composed of 60 SMD 5050 LEDs/meter mounted on white flexible PCB. With IP65 splash protection. For details and specifications, see below. 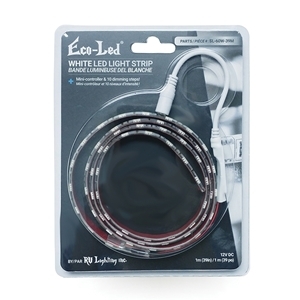 16 feet (5 meters) roll of 10 millimeters wide warm white LED light strip. Comes with Red 3M tape on the back, DC adaptor & cleaner pack. The strip is composed of 60 SMD 5050 LEDs/meter mounted on white flexible PCB. With IP65 splash protection. For details and specifications, see below. 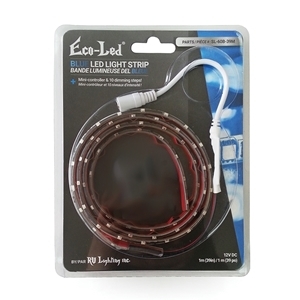 16 feet (5 meters) roll of 8 millimeters wide blue LED light strip. Comes with Red 3M tape on the back, DC adaptor & cleaner pack. The strip is composed of 60 SMD 3528 LEDs/meter mounted on black flexible PCB. With IP65 splash protection. For details and specifications, see below. 16 feet (5 meters) roll of 8 millimeters wide cold white LED light strip. Comes with Red 3M tape on the back, DC adaptor & cleaner pack. The strip is composed of 60 SMD 3528 LEDs/meter mounted on black flexible PCB. With IP65 splash protection. For details and specifications, see below. 16 feet (5 meters) roll of 10 millimeters wide blue LED light strip. Comes with Red 3M tape on the back, DC adaptor & cleaner pack. 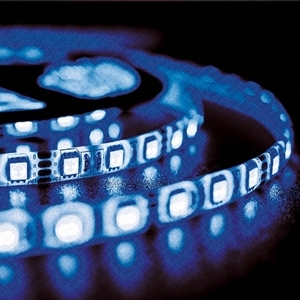 The strip is composed of 60 blue SMD 5050 LEDs/meter mounted on white flexible PCB. With IP65 splash protection. For details and specifications, see below.